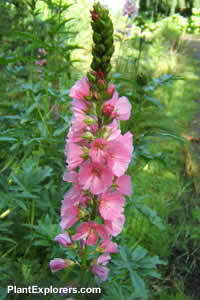 Perennial herb with alternate, palmately-lobed leaves, bearing deep pink hollyhock-like flowers in a terminal spike. Height 18 inches to 4 feet. This is a tall and showy tap-rooted plant that is important for hummingbirds and both butterflies and their larvae. Sow seed in containers in a cold frame in autumn or spring. Grow in full sun to light shade, and in moderately fertile, humus-rich, moist or wet soil. For maximum freshness, please keep seed refrigerated in its original packaging until it is time to plant.